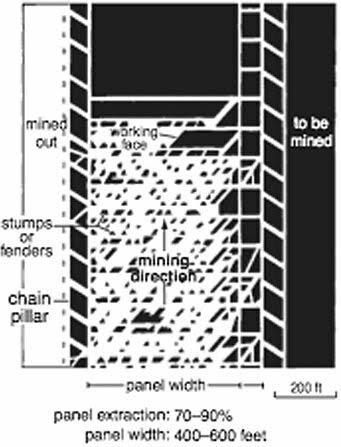 In recent posts I have written about room and pillar mining, where the miners drive tunnels through the relatively horizontal coal seam, until they come to the edge of the property. Depending on the accuracy and honesty of the mine surveys, they then stop. I mention this latter because, on occasion, miners who later worked in an adjacent mine, thinking that they have plenty of room, have worked close to the boundary on the other side, and suddenly, and often tragically, have found that they were too close. Water or gas that had collected in the old workings flooded into the new ones, with usually fatal results. (The Quecreek Mine Rescue was an exception). Once the mine has reached the boundary, there is still a lot of coal left in the pillars. 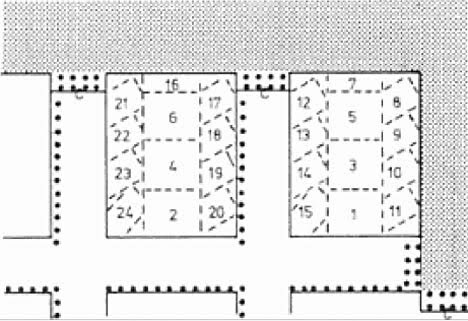 If the mine tunnels are 15 ft wide, and the pillars are 45 ft wide and the coal is 6 ft thick, then using a rough rule that a cubic yard of coal weighs a ton, gives that the original tonnage between the tunnel center-lines, assuming square pillars, would be 800 tons (20x20x2). The pillar left contains 450 tons, so that the initial extraction only removed 44% of the coal and 56% remains in the pillars. So, providing that the mine does not have major surface construction that would be harmed if the ground subsided, the miner might choose to remove some of that coal, as he retreats back from the boundary. (Although David Kuchta will tell you of times when folk were less fussy about worrying about the houses on the surface). This practice is known as “pillar robbing,” though to get away from the negative picture that this raises, it may be called “pulling” or “drawing” the pillars. 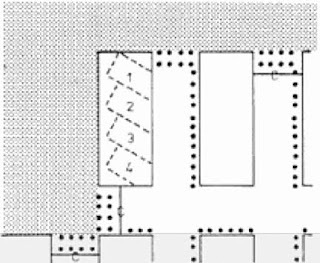 Essentially the miners will start at the boundary and work back towards the shaft, removing coal from the pillars in a systematic pattern as they go. And if you pull out the supports that hold the roof up, then that roof will collapse into the opening beneath it. 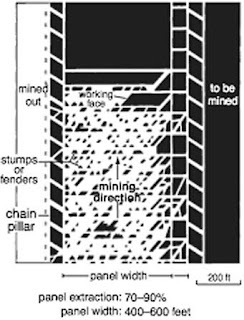 This is where there is some skill and forethought required in planning how to mine out the pillars, and to control the way in which the roof breaks. If the pillars are pulled properly, then the coal that is left, because some is, will crush sufficiently slowly that the miners can have enough warning to be out of the way, and it will control the way that the roof breaks. 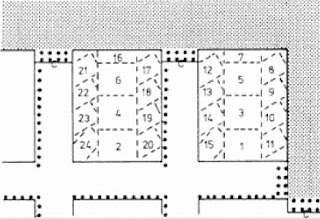 And then look at a mining plan after the mine has pulled most of the pillars from a section. With 80% extraction the mine is now only leaving 160 tons of coal behind in the fenders or stumps. Fenders are usually the larger pieces of pillars that are left along the edges of the path the machine must move along, stumps are the residuals in the body of the pillar. 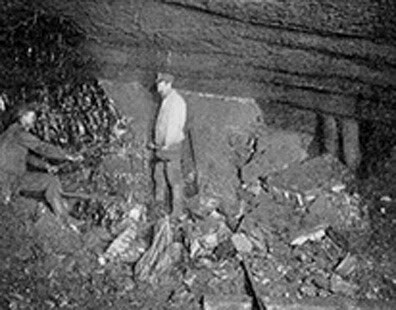 As the miner removes the coal, to keep the operation safer, while the coal is being removed, wooden props used to be installed that would hold the roof in place. That practice, with the men under unsupported roof is no longer used. Now the coal is extracted using, increasingly, remotely operated mining machines, with the supports more closely located around the mining area and increasingly being hydraulic. The small black circles are where the props (historically wood but now hydraulic props) are located. 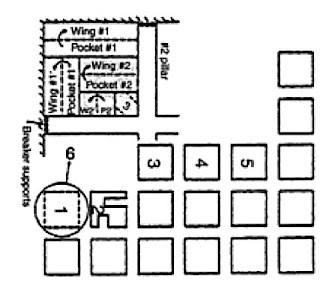 Pocket and wing mining – the pockets are removed in sequence, the wings are left to hold up the roof. In stronger coals or where the roof is better more of the coal can be removed. 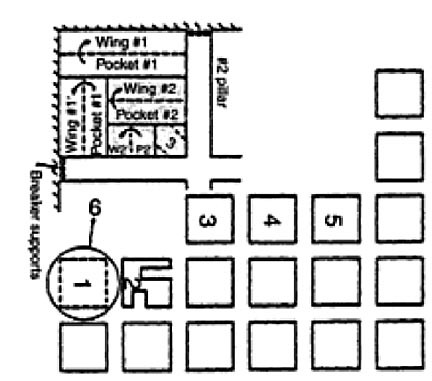 The reason that the props are located close together at the edges of the remaining rooms, is that the roof layers above the area will start to break after the coal is removed. By establishing the props along the edge of the pillars the breakup from the previous coal removal will be stopped at the edge of the existing pillars. The roof breaks into fragments as it falls, and will bulk into the space left by the coal removal. This bulked up rock provides some support to the roof overlying the area where the coal is then removed in the next sequence of mining. And so the process retreats. 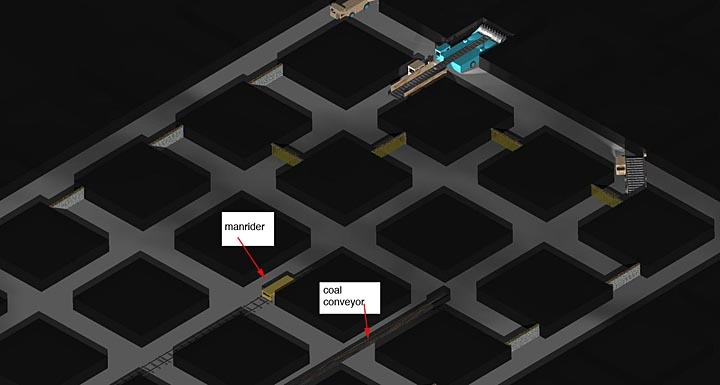 It is not as effective as getting all the coal out, and can lead to more difficult problems at the surface than an alternate method of mining called longwall, and we’ll come to that next. But pillar robbing requires a great understanding of the geological conditions before it can be safely carried out. Unfortunately when this is not the case then we get disasters such as that at Crandall Canyon.